Of course, the eID can be used online with compatible websites. This was the first topic covered tonight. 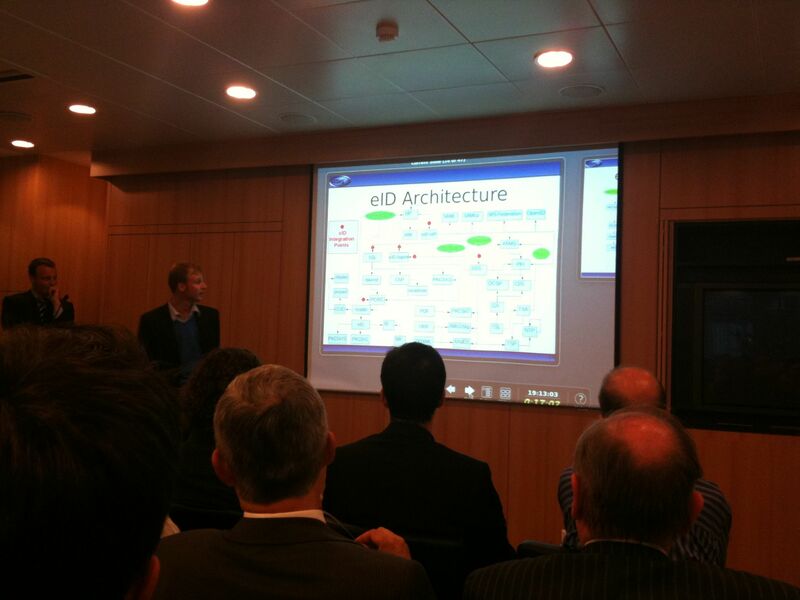 Erwin Geirnaert and Frank Cornelis presented “The Belgian e-ID: hacker vs developer“. The second part was performed by Larry Suto about the accuracy of web application scanners. Don’t forget that everybody has an eID and not all people are security experts! (even if some pretend to be 😉 ). The latest eID applet is based on Java 6 and does not require any installation on the user side. If you are interested, the code is available on Google Code under the GPLv3 license. One of the remaining problem is the risk of stolen PIN code via key loggers. That’s why some critical applications require a specific card-reader with a built-in keypad. The new applet also implements an integrity control which prevent data read from the card to be altered by a MitM attack. About the digital signature feature, two types of documents/applications are supported: OpenOffice and Microsoft Office. After the technical details about implementing the eID within the web applications, Erwin “the bad guy” given some bad examples. First, the implemetation of the eID into the web sites will not protect you against the classic web vulnerabilities! It’s just a new way to authenticate the users. Keep your developers aware of this. What are the common bad implementations? No implementation of the HTTPS protocol! The eID data can be sniffed! After a successful authentication, usage of a cookie to keep the session alive. Frank performed some demonstrations using Webscarab and demonstrated how it is easy to capture and change the eID data on the fly (without integrity verification of course). Note that a nice project is ongoing: an official validation of web sites providing eID authentication? (via L-SEC). In a new version of the report, some open source scanners will maybe be added like Skipfish or w3af. But at the moment, they give poor results compared to the commercial solutions. The job performed by web app scanners is difficult compared to the classic vulnerability scans. In this case, there is notsimple signature or patterns to detect. A lot of actions must be performed from a human point of view. That’s why the web scanners users can be grouped in two categories: A first one which find the “point & shoot” operating mode enough to reach their expected security level). The second one thinks that no automatic scanning can be used due to the complexity of modern web sites. According to the audience (the room was full of known and unknown faces), OWASP meetings have more and more success in Belgium. That’s good!